Analyze the relations between elements of a relatively large network, and display those relations using an online dynamic interface. Holding data of over 1.5 million actors and 1.3 million movies. CS Bibliography Information from The DBLP Computer Science Bibliography (DBLP). Listing over 220 (= 1,048,576) CS publications. Web interface is data-independent, and can be set to support any future source of data. Spelling Error Correction - User's input is checked for misspellings and corrected if necessary. Detailed Information for Each Link - Each link displays relevant info such as link strength and common projects. Automatic Images - Each graph element is represented by a unique image; images are assigned dynamically. Server Side is implemented in PHP and MySQL. Data was preprocessed using both Perl and C#. Client Side Interface is implemented in Adobe Flex (flash). which had been modified in order to fit project's needs. Data is passed from server to client using XML files with predifined sturcture. 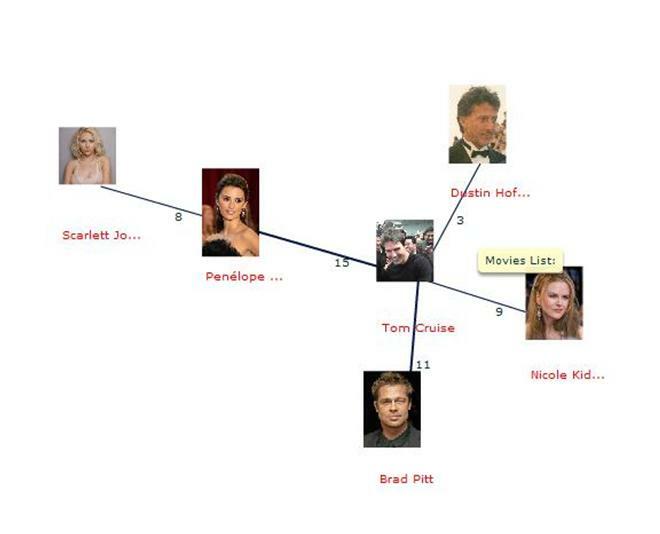 The Oracle of Bacon - Six Degrees of Separation using IMDB data. more info - Six Degrees of Kevin Bacon page in Wikipedia. Common Movies (IMDB) - Find all movies common to a group of actors. TheyRule - Shows links between members of directories of top companies in the US. DBLPvis - Shows links between CS papers writers using DBLP data.